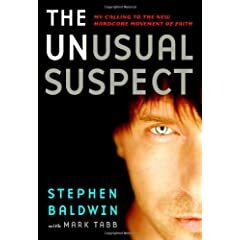 Just saw an interview with Stephen Baldwin on the Today Show about his faith. It was really great. He was so bold about how Jesus has changed his life and he brought everything that he talked about back to the Bible. He even challenged Bono to share the gospel during his concerts. Amazing stuff! Its exciting to see such high profile and passionate words about the life changing love of Jesus. You can catch the story here. Yeah, I do like that someone in hollywood is speaking out. And really, who am I to be speaking out? I mean, I'm crazy too. Just maybe not Spicy Jesus Roll crazy... Also--neither you nor Ginny have posted pics of her visit and I want to see some!! Grr..